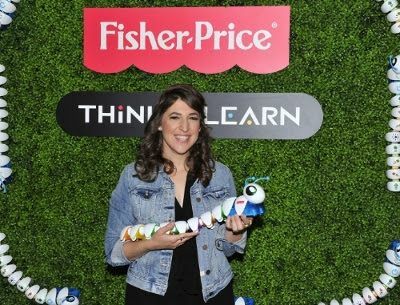 Preschoolers Discover 21st Century Skills At Fisher-Price Think-a-Thon, With Host Mayim Bialik | Mattel Inc.
LOS ANGELES, Sept. 28, 2016 -- Today, Los Angeles preschoolers joined actress, author, neuroscientist and mom, Mayim Bialik at the first-ever Fisher-Price Think-a-Thon, an event aimed to inspire little learners to be big thinkers. The event showcased toys from the new Fisher-Price Think & Learn line which are designed to teach young learners 21st century skills they'll need to be successful in the future. Inspired by "hackathons" where coders meet to do collaborative computer programming, preschoolers at the Fisher-Price Think-a-Thon came together to get the most out of playtime. The children participated in skill-building play activities with Think & Learn toys, including a Code-a-pillar Obstacle Course, Smart Scan Color Chameleon Color Bingo, and Smart Scan Word Dash Hide & Seek. "Since before I even became a mom, I've been fascinated by how children learn and how their brains work," says Bialik. "Children have an innate desire to figure things out in the most creative ways and as a scientist and a mom myself, I enthusiastically encourage creating environments where children can experiment. Nurturing that innate curiosity through play is the best way to encourage a love of learning, whether they're interested in becoming a doctor, an actor, or anything else they can dream up." Developed to expose preschoolers to key 21st century skills like communication, critical thinking, creativity and collaboration as well as the3Rs -reading, writing and arithmetic, the Think & Learn line of toys encourage active, hands-on play. For example, children experience following directions with the Smart Scan Word Dash and problem solving with Code-a-pillar, while some Think & Learn toys teach colors and counting- all important skills that prepare children for school. In a study recently conducted this month by Fisher-Price with parents of children 2-10 years of age, 87% of parents agreed that hands-on play was a "very important way for their child to learn" and 90% strongly agreed that "trial and error" was a great means of learning. "What's been missing in the preschool aisle are toys created to both engage kids in really fun, active play and build skills for school and life," said Lisa Mancuso, SVP of Fisher-Price Global Brands. "With the Think & Learn line, we are aiming to bridge that gap and are thrilled with the response from children and parents." "Preschoolers learn best and retain more when they're engaged in active play," said Deborah Weber, Director of Early Childhood Development Research, Fisher-Price. "When children are physically rearranging the Code-a-pillar segments to cause a different outcome, or scanning two colors on the pages of their favorite book with Smart Scan Color Chameleon to create the color purple, they're making the connections that spark a-ha moments. That's learning and it's all fun!" The Fisher-Price Think & Learn line is available now. Visit www.fisher-price.com/thinkandlearn to learn more about the toys, find a retailer, or get play tips to replicate some of the Think-a-Thon activities at home and extend the play. In 1931, Herman Fisher and Irving Price embarked on a journey to change the toy industry. Their goal: creating playthings that inspire a child's development. More than 85 years later, Fisher-Price remains deeply rooted in the belief that play is the way children learn best. To this day, understanding the importance of play in building a child's skills is the fundamental principle, as the company strives to enrich the lives of families with young children around the globe. United by the passion for a child's safe care and development at each age and stage, the people of Fisher-Price work tirelessly to bring families the best toys and baby products in the world. Some of the company's best-known brands include Laugh & Learn®, Little People®, Power Wheels®, and Imaginext®, and it's also a leading developer of character-based toys for children's programming such as Thomas & Friends™, Blaze and the Monster Machines and Mickey Mouse Clubhouse. Fisher-Price is a subsidiary of Mattel, Inc. (NASDAQ:MAT). For more information, visit www.fisher-price.com (U.S.) and www.fisher-price.ca(Canada) or connect with Fisher-Price on Instagram, YouTube, Facebook, Twitter or Pinterest.